It would take days, months, to discuss & map out the entire modern Marvel universe, and honestly I’m not the guy to do it. I’ve seen only the bare minimum required to get by, as I’m not a huge comic book guy and I don’t have the time to make up for lost experience. I’ve seen Iron Man, The Avengers, Guardians of the Galaxy, and Avengers: Age of Ultron, enjoying the connected story lines but failing to jump on board the superhero train. Guardians was my favorite by far, and I’m excited to see how that plot progresses, but I just don’t have the energy to watch all the other films, and I think I can simply say that it’s not my genre. 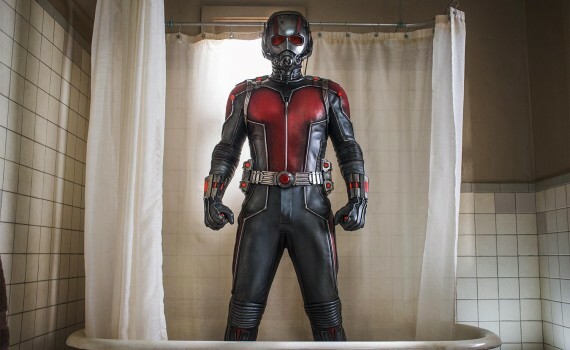 But I was in the theatre to see Ant-Man, partly for exposure and partly because I like Paul Rudd. Also, Ant-Man is actually a pretty cool superhero, and underutilized in the books I read to my son that are based on the new movies. So I gave it a shot, enjoyed it, but have got to say, out of the infinite number of ways this character could have been presented to us, this has got to be the weirdest. Dr. Hank Pym, also known as the Ant-Man, a millionaire, a genius, a scientist, and a sad old man. He lost his company to the power-hungry Darren Cross, he lost his wife Janet (aka the Wasp) during a daring mission, and he has lost his daughter Hope to the despair that ate his own heart. The only thing left to him is his famous formula, the Pym particle, the recipe for changing the size of organic life. He protects this product with his life, knows that it would be dangerous in the wrong hands, and is devastated to learn that Cross is about to solve the formula on his own. Hank & Hope must stop Cross at all costs, and that’s where Scott Lang comes in. An ex-con and a master burglar, Scott is recruited to be the new Ant-Man, to stop Cross from unleashing his Yellowjacket invention, and to save the world from miniature mayhem. After so many giant, comic book epics, Ant-Man is a partial return to the original formula that began this whole, colossal, money-making machine, with a little extra oddity thrown in. It’s a throwback to Iron Man, the comedy & the simplicity, and feels less Marvel than the films we’ve become accustomed to. The action isn’t as intense as it could have been, relying more of cool special effects and less on explosive bursts of superhero punches. And the comedy quickly becomes the focal point, something that surprised me, even coming from a Paul Rudd movie. Imagine They Came Together, FernGully, and The Rocketeer all combining to form one film and you’ll have some idea what to expect from this highly unusual project. The humor was intensely over-the-top, constant, and extremely hit-or-miss, having me either on the floor laughing or sadly shaking my head. It seems crafted by a dozen different minds, all throwing in their own styles to fit each scene, never combining to create one solid feel. I laughed, sure I did, but far too often it was combined with an eye roll or a hanging of my head. Paul Rudd cracked me up as he always does, but as a hero I just didn’t see it. He’ll have to fit his character in with the others when all the stories come together, and I just don’t see how that will work. He’ll be the comic relief I guess, which is fine, but someone had better write his lines to be a little less juvenile and a little more consistent. Incidentally, and without giving too much away, we’ll be seeing more of Evangeline Lilly too, although I don’t think that’s a good thing. She and Michael Douglas were terrible as Hank & Hope Pym, treating every line like something they were just fed after forgetting what to say. The side characters made the movie, actually, when without them I think the whole thing would have flopped. Corey Stall was a good villain, Anthony Mackie had a Falcon cameo, Scott’s daughter Cassie was well-played by some cute kid, T.I. held his own, and Michael Pena pulled off what is undoubtedly the best performance of his career. He stole the show, made the comedy work, and reminded us that this movie was supposed to be silly. Why, I have no idea, and I can’t imagine what brains stormed this film, when Ant-Man could have been introduced to us in a million different & better ways. But they did what they did, it worked well enough to be fun, and if you sit down expecting mostly insanity with a tiny bit of Avengers sprinkled in, you’ll do just fine.